Where can I send suggestions to? My question has still not been answeredI have a problem with SmartStore.com.au, what should I do? How do I update my account information, incl shipping address, email address? I have a problem with SmartStore.com.au, what should I do? 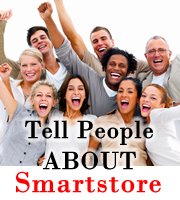 Smartstore is an online company that offers customers high quality merchandise at very affordable prices. As we buy in bulk, import our own products and sell factory-direct, we can offer our customers huge savings off recommended retail prices. To create a new account please click on Login , and then fill out the appropriate information. You may start shopping once you have created your new account. "Your Account" and then fill out the new details. To retrieve your password, please click on "Forgot Your Password" at the login page, and then enter your email address. We will send your password to your billing email address.